MOVAX Piling Hammers are excavator-mounted, hydraulic impact-type hammers for driving load-bearing piles or assisting in sheet pile driving in even the most difficult soil conditions. MOVAX piling hammers can flexibly be mounted directly onto the excavator or when greater depths are required onto an excavator mounted MOVAX leader mast. Suitable for a wide range of piles including sheet piles, H-beams, tubular steel piles, timber piles, concrete piles etc. MOVAX piling hammers are the optimum solution for a wide range of piling requirements and a variety of site conditions including difficult soil conditions. The same unit can flexibly be utilised either excavator – or excavator-leader mast-mounted. 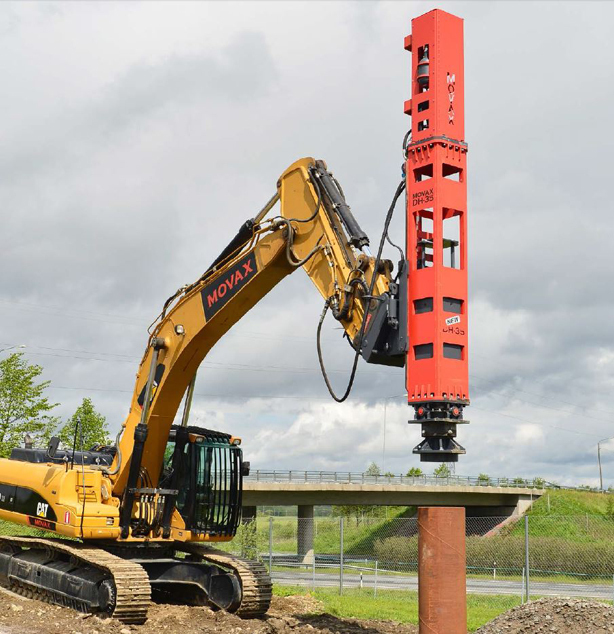 MOVAX piling hammers can also, for instance, be utilized to complete a pile installation after reaching refusal with a side grip pile driver or when load testing is required. MOVAX piling hammers are the optimum solution to complete a pile installation after reaching refusal with a side grip pile driver of when load testing is required.